A few Arsenal fans have noticed an interesting picture in a screen grab from the club’s official media channel. While no one can know for sure, it looks a lot like former manager Arsene Wenger is hiding nearby as Unai Emery enjoys his first day at the Gunners’ training ground. 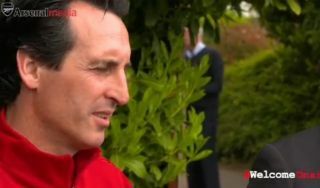 One eagle-eyed fan tweeted about it, with a tall, smartly-dressed, grey-haired man spotted behind a nearby hedge while Emery conducts an interview. Given that Wenger spent 22 years at Arsenal before stepping down at the end of this season to make way for Emery, one can imagine it’ll be hard for him to let go of his old club. Whatever your views on the Frenchman, he certainly seemed to dedicate his life and soul to Arsenal for a decent chunk of his life, so who can blame him for creeping around a little bit? He’s got a lot of damn trees to say goodbye to, just leave him to it. The man can’t simply leave the Arsenal? ?